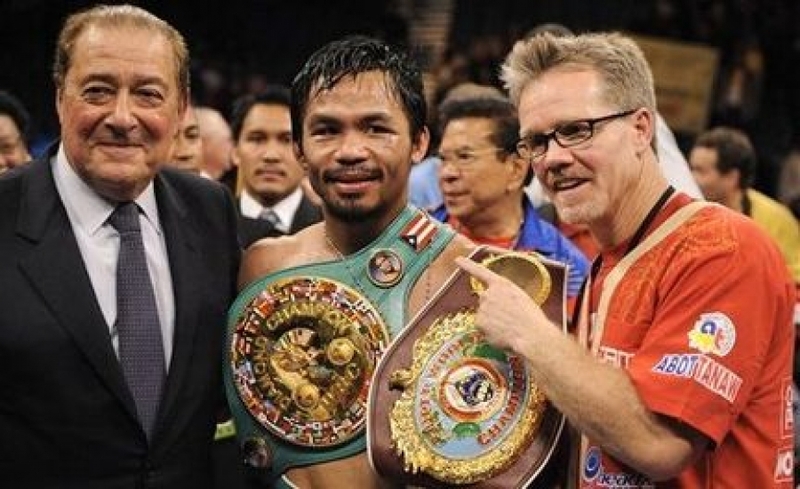 Manny Pacquiao fought for the first time in 16 years without Freddie Roach in his corner. Manny Pacquiao has refuted claims he has ditched long-time trainer Freddie Roach in favour of lifelong friend Restituto “Buboy” Fernandez and camp cook Raides “Nonoy” Neri despite his team issuing a media release last week that indicated exactly that. The media release was distributed on Friday to promote the upcoming Pacquiao fight in Malaysia when he will take on WBA “regular” champion Lucas Matthysse 39-4 (36) of Argentina at in Kuala Lumpur on July 14. “Pacquiao will be joined by his new promotions team along with trainers Restituto “Buboy” Fernandez and Raides “Nonoy” Neri,” the final sentence of the media release stated. But Pacquiao 59-7-2 (38) is now backpedalling on that statement, claiming he will make a final decision on his training team by the end of the week. “Contrary to statements which I personally did not make that are circulating in the media, I have not made my final decision who will be my head trainer for my July 14 fight with Matthysse,” the 39-year-old Filipino icon posted on his social media accounts on Sunday. News of Roach’s dismissal appear to hit the 58-year-old hard, who has trained the multi-divisional champion ever since he first came to the United States from the Philippines as a skinny super bantamweight almost 17 years ago. During that time the two have won world titles in every weight class from 122-pounds up to junior middleweight. Last July Pacquiao lost his WBO welterweight world title to then-unknown Australian Jeff Horn in front of a crowd of over 51,000 people at Suncorp Stadium in Brisbane, Australia. Roach shouldered some of the blame for the unexpected loss as the Pacquiao team tried to come to terms with the result. Their 34-fight partnership has appeared on the rocks ever since. After hearing of Friday’s media release, Roach released his own statement to the media. “Manny and I had a great run for 15 years — longer than most marriages and certainly a rarity for boxing. I wouldn’t trade any of it. Inside the boxing ring and the political ring, I wish Manny nothing but the best.